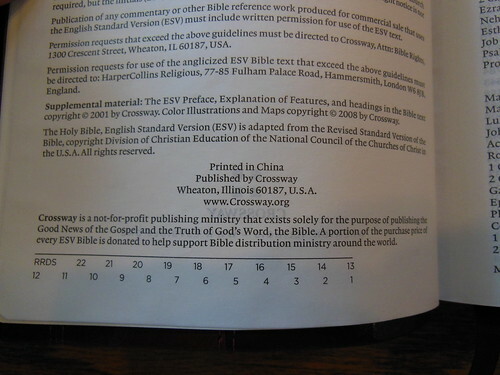 Review of the Crossway E.S.V. 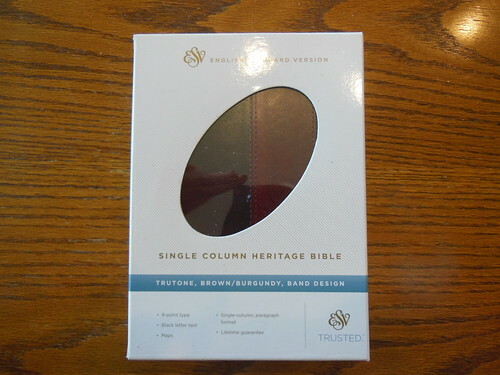 TruTone Single Column Heritage Edition Bible. I purchased this Bible because it was on sale for 80% off. I figured I could write a review, and then gift it to someone. After receiving it, I might just keep it for a rebind project. It arrived undamaged. It was in a cardboard box with two other ESV Bibles, I ordered at the same time. This one has a clamshell retail box. 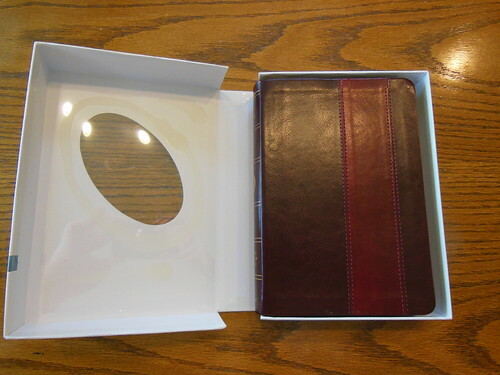 If you need to store your Bible, it is always a good idea to keep the retail box. 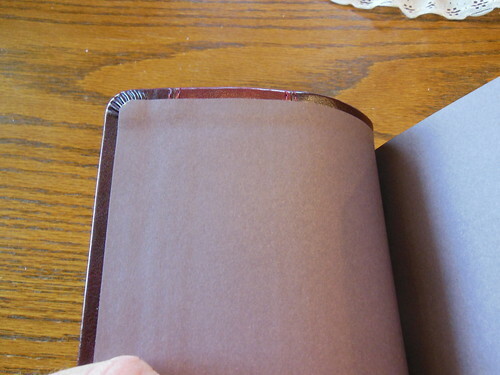 This Bible is the soft leather-look, TruTone brown/burgundy, with band design. 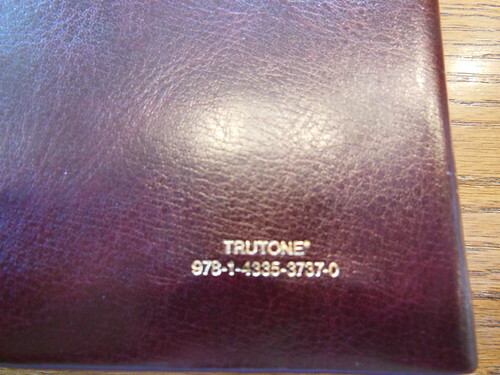 TruTone is a synthetic cover material that simulates leather. It is one of the better synthetic covers on the market. 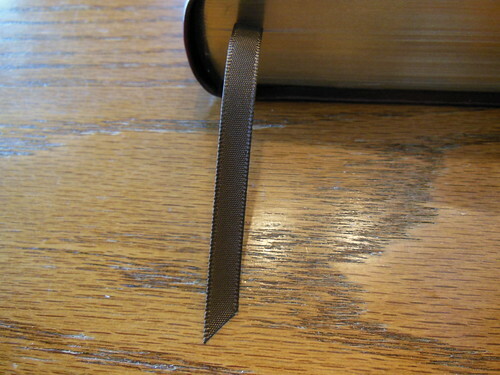 The inside liner is paper as this is a case bound Bible. 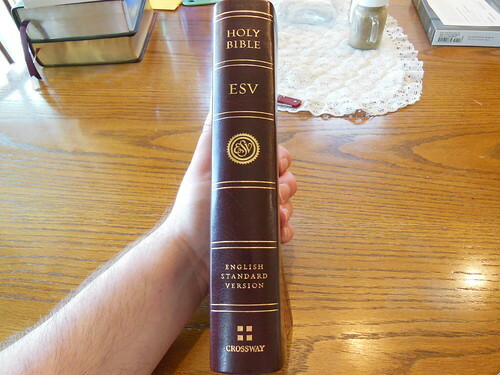 The cover around the spine is ornamented with, “Holy Bible, ESV, the ESV logo, English Standard Version, and the Crossway logo” in gold. There are brown head and tail bands, as well as one brown ribbon marker. 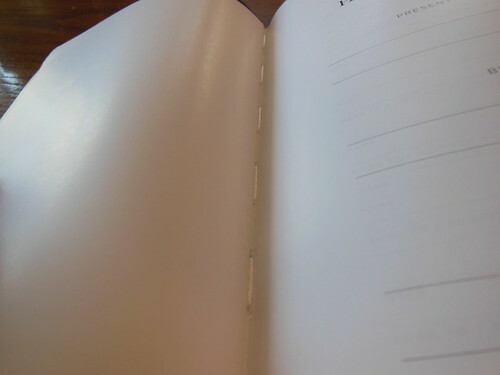 The spine, and corners are rounded. 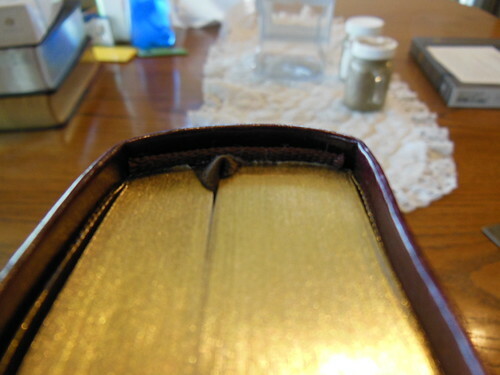 The page edges are gold gilt. There is a presentation page up front, along with the typical copyright/publisher’s information page. I really like the size of this little text edition. It isn’t too big, or small. It measures about 5.5”x7.5” It is pretty portable, though not as much as a true compact, pocket size, thinline, or ultrathin. Of course you would lose the font size and paper quality to drop down to those sizes. 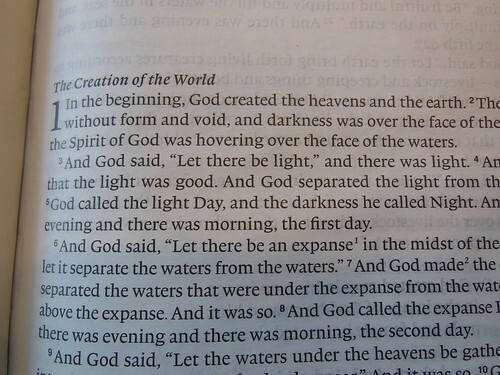 I think this is a pleasing compromise in Bible design. 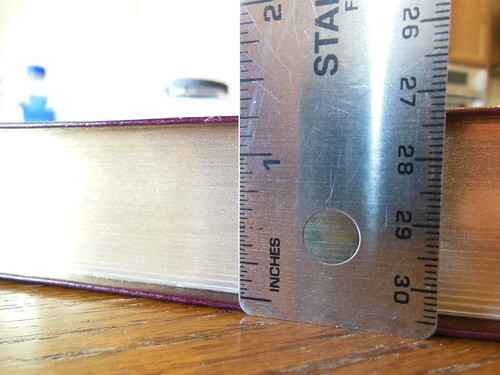 Since it is a single column text edition, it can afford to be smaller than a reference Bible. 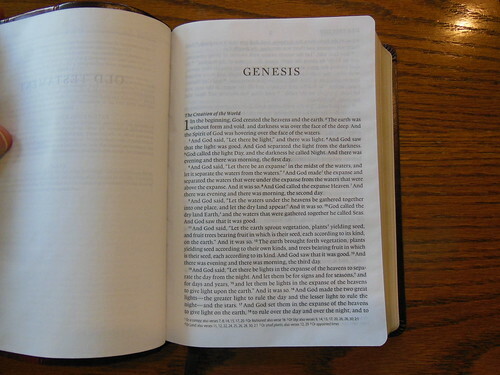 It also utilizes a 9 point Lexicon font, which is a great choice for a Bible of this size. Crossway also employed line matching, which greatly reduces ghosting. (being able to see the text from the opposite side of the paper) The paper is 31 g.s.m. Thincoat Max, 1720ppi. Between the great paper, clear uniformly printed text, and line matching, this Bible is very legible. The spine is smyth sewn. 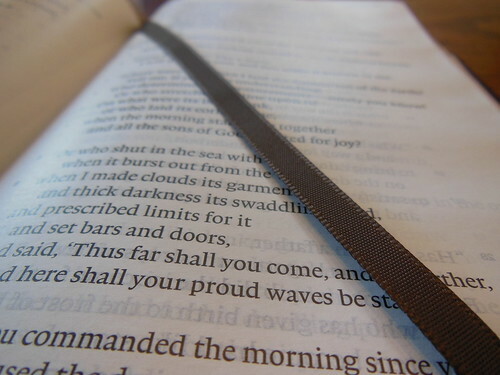 This in conjunction with the soft cover, make this a very flexible Bible. I can fold it over on itself. Then, hold it like a magazine in one hand. This is my prefered way to read. It also opens fairly flat. I don’t think it is suited well to pulpit duty as it is a paragraph format Bible. 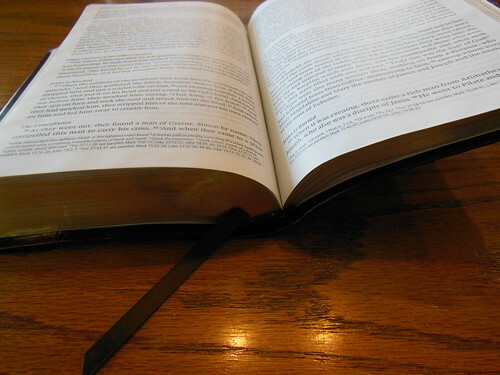 It lends itself to devotional, and daily reading. It would be perfect for that with one more ribbon marker. 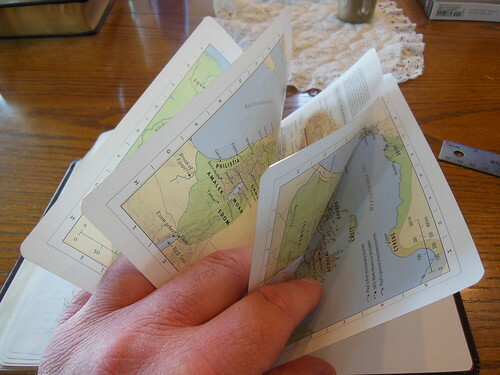 There is not a concordance or any other helps or features except for some colored maps in the back. My overall impression of this Bible is favorable. I think it fulfills the purpose for which it was designed in an exemplary manner. It is a great value, legible, portable, durable, and flexible. It is not so nice, that I’m afraid of hurting it. It is a good value and should provide you with years of service. You can pick up your copy at Christianbook. Amazon also sells them. Make sure to check out all of the pictures of this Bible on my Flickr page.